We'll just come out and say it: Professor Layton and the Unwound Future is the best game in the series to date. That's not to say it's leaps and bounds better than its predecessors, because in all regards it's remarkably similar. The improvements here are subtle, and rightly so, as we wouldn't want it to deviate from the tried-and-true Professor Layton formula. Most importantly, the puzzles are as clever and engaging as ever, and it presents easily the best story of the trilogy. Like the first two entries in the series, the gameplay focuses on a string of standalone brainteaser-style puzzles that you encounter as you move from place to place, talk to people, and tap around with stylus to explore the environment. Puzzles range from logic puzzles, spatial puzzles, word puzzles, number puzzles, sliding block puzzles and tons and tons more. 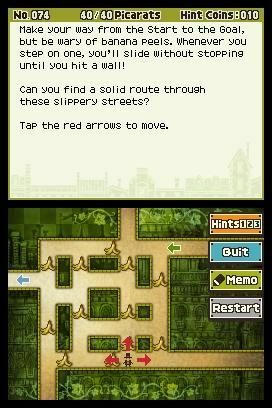 If you typically like the kind of brainteasers that require careful thinking without relying on specialized knowledge like higher math or trivia, you'll love the variety of puzzles in every Layton game, including this one. The story begins with Layton and his prot%26eacute;g%26eacute; Luke attending a time machine demonstration in London that goes horribly awry, and a titillating mystery ensues in the form of a letter to the professor allegedly written by Luke %26ndash; from 10 years in the future. Most shocking of all is that apparently in future Luke's world, our gentlemanly Professor Hershel Layton is now an evil crime lord who rules a semi-dystopian London with an iron fist and an army of goons. But is everything as it seems? Is time travel really possible? More so than the first two games, Unwound Future is in the spirit of a classic detective mystery, and as Layton uncovers each new clue the mystery just gets more intriguing. Unwound Future does offer a few new additions too, including three new minigames. Like the mechanical dog and hamster in the first two games, you now have three side games to complete: a picture book where you collect stickers of objects to fill in the gaps in the story, a toy car with complex track-based puzzles, and a parrot with puzzles where you help him navigate through a course from point A to point B. Of the three the toy car is easily the most challenging (some of the track solutions are incredibly difficult to figure out), and the parrot game is a fun diversion (way better than the tea making game in PL2), but the picture book game is a bit dull and easy, and feels like merely a means to an end, since completing each game unlocks bonus content. Aside from the minigames, the only real addition to the main game is the new "superhint" option in each puzzle. If you've spent ahint coinon each of the three regular hints and you're still stumped on a puzzle, you can spent twocoins to unlock a superhint that in most cases basically tells you how to solve the puzzle. We didn't use it often, but it was a welcome option in a few cases, and it%26rsquo;s way less icky feeling than looking up a cheat online. And as usual, you can findhint coinshidden everywhere by tapping around the scenery with the stylus. While it's totally not necessary to play the first two Layton games (Curious Village and Diabolical Box) to play Unwound Future, Layton fans who played the first two will get more enjoyment out of the story. Now that the characters of Layton and Luke have been established in the first two entries, this is the first game in the series to feature a story that's actually character driven and plays off the background of Layton himself. Unwound Future even indulges in some awesome inside jokes, like a running gag about how we never see Layton without his hat %26ndash; at one point during a cutscene cinema the camera even cuts away right as he's about to take it off. And speaking of cinemas, the cutscenes and hand-drawn art are as beautiful as ever, and there's way more art and voiceover than before. For those who enjoyed the first two Layton games, Professor Layton and the Unwound Future is a must-have, period. And if you haven't played a Layton game yet, what are you waiting for? This is easily one of the strongest series on DS in every regard, from the brilliantly crafted puzzles to the exquisite art. If you are interested in the series, we recommend starting from the beginning though. You'll be glad you did.